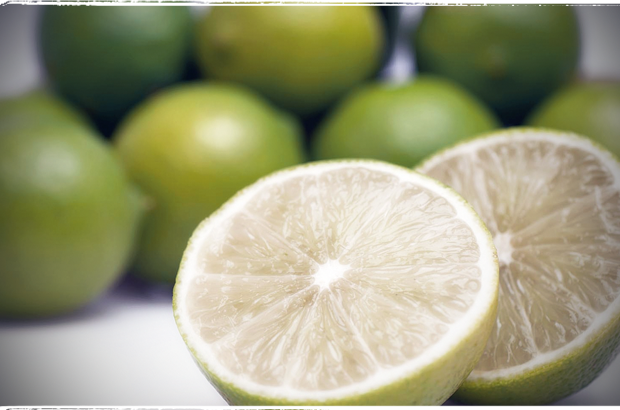 Limes are picked when they are green, although they are in fact fully ripe and juiced up when their skin is yellow. We have a small quantity of Native Blood Limes which grow on spiny bushes and are difficult to pick. They have a maroon coloured skin, are rather tiny (smaller than a golf ball), and the juicy flesh has the blooded look of a blood orange. With a strong zingy citrus flavour and pungent oiliness to the skin, Native Blood Limes are great baked with fish, make a nice twist to a gin and tonic, or enjoyed freshly squeezed with oysters. Native limes have a light orange coloured skin and hardly any juice. This slim little fruit is something like a cumquat. The skin is the main edible portion with a mild sweetness and is nice finely diced in a salad dressing. These ripen just prior to Christmas and look a little like a small green olive. They’re very delicate and juicy with an intense lime flavour.